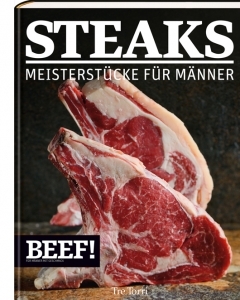 German Steak-Book, made by BEEF! Comprehensive, informative, makes you want meat! The first volume of the great BEEF! series is dedicated to one of the most sought and most manly meat at all: the steak! The book describes the path to the perfect meat preparation. Innovative and exciting recipes satisfy the wildest fantasies and barbecue taste desires. 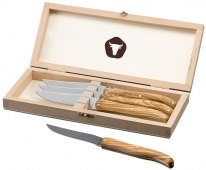 The standard for every man and his fundamental questions: what exactly distinguishes Angus, Herford or Simmenthaler? Which piece of meat is right for me and my next adventure - Porterhouse, Hanging Tender or better Sirloin? There are all important cuts and cutting techniques explained comprehensively and also the topic meat maturation is not too short. Incidentally, it should be mentioned: not least because women appreciate, the effort is low and green stuff actually can be exciting, the book introduces aromatic vegetables for the barbecue and the perfect side dish. Yummy!